Grape is the largest fruit crop worldwide and the grape pomace is an important solid waste generated from pressing and fermentation processes in wine industries. Wine industry residues are rich in bioactive compounds and, in this case, the utilization of grape by-products for alternative uses has been a focus of research. The aim of the present project is to present the primary benefits of winemaking by-products to new products focusing on grape pomace, as well as to discover novel applications in food industry, cosmetics, pharmaceutical, agricultural, livestock fields and in energy recovery systems. Moreover, new green technologies for valuable components recovery will be summarized. Recognizing emerging technologies, researchers would have the opportunity to promote development of value-added products and high-quality applications in different markets and sectors recycling of winery by-products or even side streams. This study presents the main bioactive components of grape pomace, along with new current extraction pathways, targeting the decrease of negative environmental impact in parallel to functional added value applications. The potential of the valorization of the specific agroindustrial by-products has to be supported by the extensive information available on their valuable content promoting health. In parallel, in these wine-making processes, the time between the generation of waste and valorization activities, along with recover procedures, has a direct impact on the final concentration of phytochemicals and, therefore, on the potential as a source of bioactive compounds. Nevertheless, most of the time valorization also needs additional concerning for the development of novel, isolation, purification, and recovery procedures to improve phytochemical profile and to deliver standardized potency in different fields. Grape is a very high value crop that is grown and produced in vineyards. According to the FAO (Food and Agriculture Organization 2015) statistics, grape is the largest fruit crop in the world. In Mediterranean countries, the annual production of grape pomace can be as high as 1200 tonnes per year, while at the same time, such a large volume of waste is disposed in open areas causing environmental and economic problems. The annual production worldwide can reach almost 70 million tons and around 80% is used for wine production, whereas 20% of processed grapes remain as pomace. As stated in IOV (International Organization of Vine and wine) Statistical Report on World Vitiviniculture, 39% of the total world grape is produced in Europe, 34% in Asia and 18% in America. Spain (14%), China (11%), France (10%), Italy (9%) and Turkey (7%) represent almost half the world vineyard. In Italy, France and Spain, which are the three main wine producers in Europe, the annual grape pomace generation can be as high as 1200 tonnes per year (FAOSTAT, 2014). It is estimated that grape production in Greece is 1,045,990 tonnes whereas the average annual production of grape skin pulp was 14,200 tonnes for the years 1996–2000 (Arapoglou et al. 2002). Greek Wine Federation data show that more than 300 grape varieties are cultivated in our country. The main grape varieties include Moschofilero, Roditis, Savvatiano, Sideritis, Vilana, Robola, Vertzami, Xinomavro and Agiorgitiko, along with Chardonnay and Cabernet Sauvignon. The waste from winemaking process mainly consists of pomace, clarification sediment such as lees, and yeast sediment (as shown in Fig. 1). The grape pomace is the solid material that remains after the pressing and the fermentation processes and accounts for 20% of the original grape weight (as shown in Fig. 2). It consists of two main fractions known as the seedless pomace (pulp, skin and stem) (Fig. 3) and the grape seed itself (Beres et al. 2017). Wine lees represent 2–6% of the total volume of wine produced and they mainly contain ethanol, tartaric acid, and yeast cells with phenolic compounds (Dimou et al. 2015). The by-products generated after grape exploitation constitute a very cheap source for the extraction and are characterized by the presence of high value ingredients including hydrocolloids, dietary fibers, lipids, proteins and natural antioxidants flavonoids mainly in the form of phenolic compounds (as shown in Fig. 4), which can be used as dietary supplements, or in the production of phytochemicals, thus providing an important economic advantage (Ahmedna 2013). Over the past few years, utilization of grape pomace has been inefficient. Large amounts of pomace are produced during a short period of harvesting, which increases the concentration per area. Land field discretion or incineration may be detrimental to the environment. The high phenolic compound amounts decrease the pH of the pomace as well as increasing resistance to biological degradation and causing environmental concern. However, due to the increasing attention to sustainable of agricultural and consumer demand for the use of natural over synthetic compounds, there is great interest in the utilization of grape by-products as food additives, neutraceuticals, ingredients of functional foods/dietary supplements, medical remedies, fertilizers, animal feed, antimicrobial components, cosmetics and finally as biomass for biofuels. Referring to grape pomace utilization, there is an obstacle to be overcome and concerns for its composition. As Brenes et al. (2016) have already stated, the quantity and quality of bioactive molecules depend on the grape variety, location, fertilization conditions, soil and harvest period. Nevertheless, these differences should not be a problem, since they represent different application possibilities. In this sense, a better knowledge of grape pomace composition enables to find industrial uses and to evaluate the importance of the raw material variability (Llobera and Cañellas 2007; Rondeau et al. 2013) on the final application. Thus, one of the current challenges is the reclassification of such wastes as co-product that can be reprocessed, aiming to reduce their negative impacts, as well as to obtain high added value materials. To achieve that, it is necessary to have more knowledge of these novel technologies and more importantly explore the possibility of application of these latest technologies to the recovery downstream processing. The present work will summarize state-of-the-art technological approaches concerning extraction; simultaneously, the application of the bioactive components that originated from the by-products in the wine industry will also be reviewed. 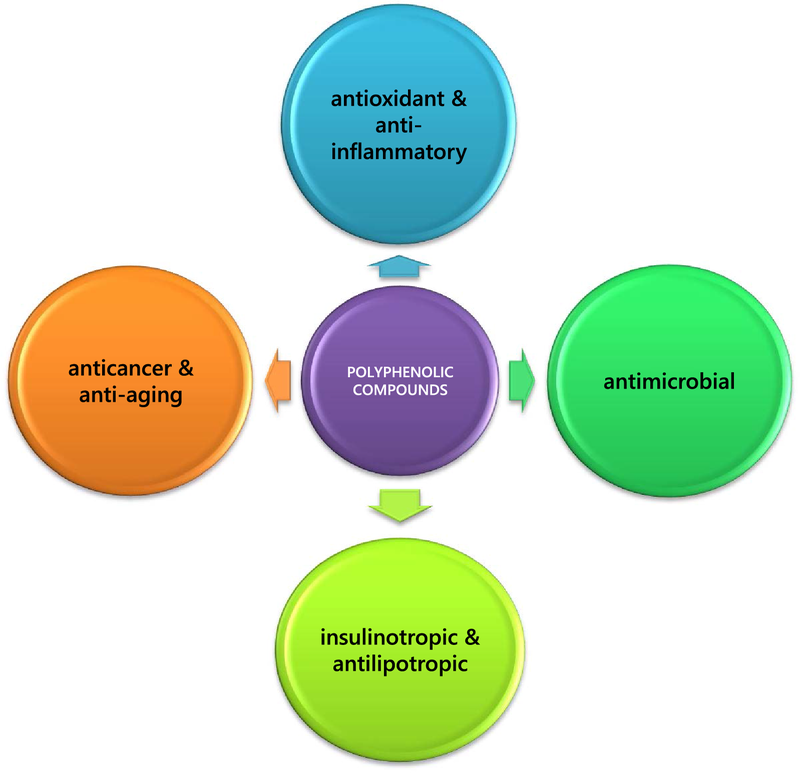 Growing evidence suggests that polyphenolic molecules have the potential to exert antioxidant, anti-inflammatory, antimicrobial, anticancer and antithrombotic effects or even antidepressant activity (Rabiei et al. 2017) (Fig. 5). Flavonoids act as potent antioxidants, metal chelators and free-radical scavengers. Through these mechanisms, phenolic compounds are multifunctional in their activity. They are capable of interfering with the progression of several chronic diseases including diabetes, cardiovascular, carcinogenic, neurodegenerative diseases and inhibiting allergic reactions and aging process. The phenolic compounds derived from red and white pomace are shown in Table 1. Recently, an important report was also presented by de Sales et al. (2018), concerning anthocyanin-rich grape pomace extract from wine industry which positively affects mitochondrial bioenergetics and glucose metabolism in human Hepatocarcinoma HepG2 Cells. Phenolic compounds in red wine and grape pomace. The antioxidant capacities of phenolic compounds extracted from different varieties and fractions of grapes have been evaluated via several methods such as oxygen radical absorbance capacity (ORAC) assays, 1,1-diphenyl-2-picryhidrazyl (DPPH) method, crocin bleaching assay (CBA), 2,2′-azino-bis-(3-ethylbenzothiazoline-6-sulfonic acid) (ABTS) assay, the thiobarbituric acid reactant substances (TBARS), the trolox equivalent antioxidant capacity (TEAC) assay and the ferric reducing antioxidant power (FRAP) assay (de Ruiter et al. 1982; Brand-williams et al. 1995; Benzie and Strain 1996; Cano et al. 1998; Prior et al. 2003; Wang et al. 2004; Chatterjee et al. 2005). In other studies (Bagchi et al. 2000; Urquiaga and Leighton 2000), grape seed provided excellent liver and kidney protection from acetaminophen overusing, through regulating bcl-XL gene, DNA damage and by reducing oxidative stress. Surprisingly, both in vitro and in vivo models of GSPE (grape seed phenolic extracts) appeared to be highly bioavailable and significantly more effective in protecting against free radicals and free radical-induced lipid peroxidation and DNA damage compared to vitamins C, E and β-carotene. At a randomized clinical trial, De Groote et al. (2012) found that obese adults who were treated with 400 mg/days catechin rich-grape seed extract (CGSE) and resveratrol triphosphate (RTP) for 28 days had a better effect on oxidative markers compared to resveratrol treatment alone. Researchers also observed a two- to eightfold increase in insulin secretion by isolated mice pancreatic islets at 5.5 mM and 16.5 mM glucose concentration in the presence of grape seed, skin and stem extracts. Anthocyanins seem to exert anti-hyperglycemic and insulinotropic effects after exposed to pancreatic β-cells (Doshi et al. 2015; Nabavi et al. 2015). In accordance with previous studies, a research on 8 healthy adults showed that supplementation with 100–300 mg grape seed extract following a high carbohydrate meal, resulting in significantly reduced postprandial glucose levels up to 2 h after ingestion (Sapwarobol et al. 2012). All these findings indicate a potential use of grape pomace in the treatment of type II diabetes and diabetic retinopathy. In cell line models, extract from the grape seed showed a significant anti-tumoral activity in lung, colon, breast, bladder, leukemia and prostate tumors through several mechanisms (Dinicola et al. 2014). Proanthocyanidins from grape stems at low doses rather from grape seeds inhibited liver (HepG2) and cervical (HeLa) cell growth in vitro (Apostolou et al. 2013). Grape seeds have been known to inhibit cancer induction by modulating the redox balance showing both antioxidant and pro-oxidant action. In addition, they appear to coordinate the up- and down-regulation of MAPK kinases, PI3K/Akt, NF-kB, cytoskeleton proteins and metalloproteinases. More recently, the study of Hamza et al. (2018) provides evidence that the grape seed extract presents a possible anti-cancer protective effect by promoting apoptosis, inhibiting cell proliferation and blocking inflammation in hepatocarcinomas. Del Pino-García et al. (2016) also evaluated the potential of red wine pomace seasonings as chemoprotective agents in colorectal cancer. In this in vitro study, phenolic acids extracted from seedless red wine pomace were most bioavailable in the small intestine, whereas grape seeds were most fermentable in the colon. Treatment with red wine pomace seasonings showed a chemoprotective effect through attenuation of oxidative DNA damage in colon cancerous cells. Since animal and in vitro studies reveal a potential therapeutic effect of grape seed extracts, clinical research would certify any safe pharmacological use for this purpose (Dinicola et al. 2014). Polyphenols derived from grape seed extract have been proved to attenuate amyloid-associated cognitive impairments and reduced oligomerization of Aβ peptide in Tg2576 mice (Wang et al. 2008). Resveratrol has found to protect from neurodegenerative diseases such as Alzheimer’s disease, through antioxidant activity and by stimulating the proteins SIRT1and AMPK inducing the clearance of Aβ aggregation (Ma et al. 2014). In Huntington’s disease models, suppression or activation of FOXO proteins has been proposed as a possible mechanism for promoting neuronal survival (Markus and Morris 2008). Nowadays, polyphenolic extracts and mainly proanthocyanidinic oligomers in grape seeds act as active ingredients in commercialized cosmetics products mainly due to their anti-ageing activity. Cell line studies using dermal fibroblasts or epidermal ketarinocytes suggest that polyphenols exert beneficial effects on the human skin. Gallic acid in grape pomace is especially effective in inactivating the age-related enzymes collagenase and elastase (Wittenauer et al. 2015). Linoleic acid that accounts for 71.965% of the grape seed oil (Da Porto et al. 2013) also exhibits anti-inflammatory and anti-aging effects when applied in facial skin care products. The American Academy of Dermatology provided significant evidence for the role of conjugated linoleic acid on acne and photoaged skin, after one-month trial and a 16-week research project, respectively (Letawe et al. 1998). Winery by-products due to their high bioactive content, in vitro, in vivo and on food product (beef, chicken, sausages, pork, lettuce, soups) act against food-borne bacteria including B. cereus, C. jejuni, E. coli, L. monocytogenes, S. enterica, V. cholera, V. vulnificus, Y. enterocolitica, as well as against pathological bacteria (H. pylori, K. pneumonia), viruses (hepatitis, cytomegalo, rota, noro); fungi (C. albicans, B. cinerea); parasites (T. vagilanis) and microbial toxins (Shiga toxin, ochratoxin A) (Friedman 2014). However, further research is needed to improve food safety and to identify the effectiveness of wine and wine by-products in relation to treatment of animal and human infections (Friedman 2014). The wine industry is responsible for a considerable part of the environmental problems as they dispose large amounts of grape pomace. The utilization of grape pomace as a source of functional ingredients is a promising field. The target of valorization process is the recovery of wine-making by-products for innovative product applications. When agroindustrial residues started to be raw materials for modern industries focus was given on diminishing the environmental impacts of industrial by-products, paying attention to the recovery of bioactive phenolic compounds from grape by-products and functional food production. For example, grape seed oil extraction can be applied in parallel with the recovery of both antioxidant dietary fiber and phenolic extracts from grape skins and defatted grape seeds, thus making the overall recovery strategy more sustainable. However, they do not comply with standards set by Environmental Protection Agency (2015). In this context, valorization of winery by-products provides alternatives to minimize the environmental impact of winemaking activities and to promote commercialization of dietary fibers and oil from grape pomace and extracts rich in bioactive compounds. From this point of view, technological advancements and alternative procedures are emerging to replace traditional ones and recover bioactive compounds from grape pomace, in order to promote a faster and ‘‘greener” technology, since extraction is the most important step of downstream processing. 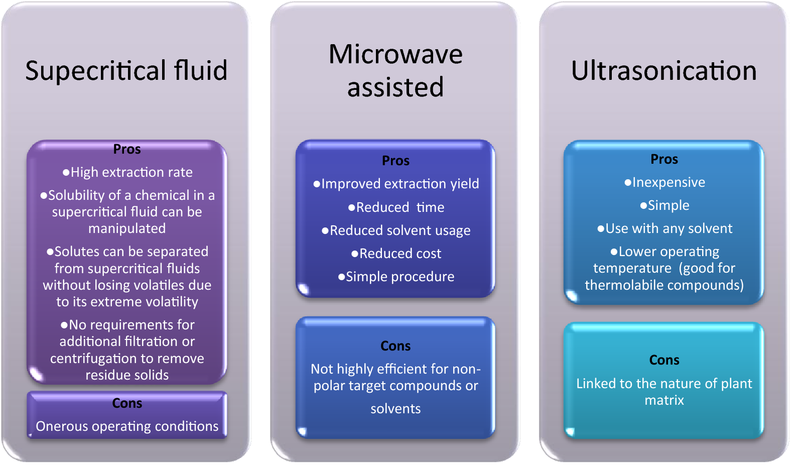 Emerging technologies to extract high added value compounds from fruit residues are considered Sub/supercritical, ultrasound- and enzyme-assisted extractions (Alexandre et al. 2018). Currently, several studies reported in the literature have evaluated non-conventional recovery methods of phenolic compounds from grape skin and seeds by different extraction methods. Classical/conventional extraction techniques in relation to bioactive compounds are based on the extraction efficiency of different solvents (Fontana et al. 2013). Just recently, in a study of Pintac et al. (2018), the efficacy of six solvents (80% MeOH, 80% EtOH, EtOAc, acetone, acidified 50% and 80% MeOH) for the extraction of polyphenolic and triterpenoid compounds was examined. As a result, EtOAc produced extracts rich in different polyphenolic classes such as phenolic acids, flavones, flavanones, flavanols, stilbenes and coumarins. In contrast, it was shown that for anthocyanins, methanol-based solvents were the most efficient. The most traditional ones are the solid–liquid extraction by mechanical agitation and Soxhlet extraction, generally using ethanolic or methanolic solutions as solvents, maceration, and hydrodistillation (de Campos et al. 2008; Amendola et al. 2010; El Darra et al. 2013; Tartian et al. 2017; Da Porto and Natolino 2018). The major challenges of these processes are long extraction time, low extraction selectivity, cost of the solvent, evaporation of solvent, toxicity, degradation of thermolabile compounds, environmental safety (Wang and Weller 2006; Galanakis et al. 2013). To overcome these limitations, alternative methods have already been practiced. Supercritical fluid extraction (SFE) is currently an environmentally alternative to conventional industrial solvent extraction. Several applications have been early developed using SFE in the recovery of value added from grape residues (Herrero et al. 2006; Ruberto et al. 2007). SFE main advantages are, that avoids the use of large amounts of organic solvents, is rapid, automatable, and selective the absence of toxic residues between products. Its drawbacks, like the difficulties in extracting polar compounds and compounds from a complex matrix, are usually overcome by approaches enhancing high extraction efficiency. In recent years it was studied the use of supercritical carbon dioxide as being neither toxic nor flammable and also available at low cost and high purity. Its critical temperature is moderate (31.2 °C), which is a fundamental issue for the preservation of bioactive compounds in extracts. Similarly, the absence of light and air during the extraction reduces the oxidation and degradation processes that may occur during organic solvent extraction. The extraction is achieved under high pressure and low temperature (Agostini et al. 2012; Da Porto and Natolino 2018). Furthermore, it is also possible to modulate the power of CO2 to perform a selective extraction (da Silva et al. 2016) and used for thermally labile compounds (e.g., polyphenols). The approach using SC-CO2 has been widely used for isolation and purification of antioxidants from grapes like grape seed oil extraction for proanthocyanidins recovery (Wang et al. 2009) or from phenolic compounds (Oliveira et al. 2013) and antioxidants (Otero-Pareja et al. 2015) from grape pomace. The possibility of using supercritical carbon dioxide (CO2) extraction method to produce high-quality grape seed oil also provides some of these benefits. The quality of the oil produced is similar to the oil obtained by organic solvent extraction after refining. Additionally, the extraction of seed oil by liquid carbon dioxide (CO2) could be less expensive since the oil produced by this method does not contain solvents; the step of the stage of distillation can be omitted. Moreover, the possible industrial application of SFE for the extraction of grape seed oil was exploited by Fiori (2007). In that work, the author proposed an integrated system producing grape seed oil and related by-products from exhausted grape pomace, achieving recoveries of 86%. Large-scale SC-CO2 fluid extraction has become a practical process for the extraction of high-value products from natural materials. Studies about pilot-scale use has also been performed along with economic evaluation presenting feasibility of application in an industrial process for phenolics recovery compounds by grape seeds (Prado et al. 2012a, b; Farías-Campomanes et al. 2013). Inherent physical and chemical properties of supercritical fluids allow the development of new processes and products (Gandhi et al. 2017). Due to these characteristics, SFE is still a fairly novel technique to target organic analytes and employs the unique properties of supercritical fluids to facilitate the extraction process. Accelerated solvent extraction (ASE) is known as pressurized fluid extraction (PLE). It uses conventional solvents at temperatures (100–180 °C) and high pressures (1500–2000 psi) to perform extraction of organic analytes from solid samples (Fontana et al. 2013). Many works applied ASE for the extraction of phenolics from grape pomace (Fiori et al. 2009). Furthermore, Aliakbarian et al. (2012) reported a novel ASE approach using subcritical water as extraction solvent, showing recoveries of phenolics from grape pomace in subcritical water at 140 °C similar to those obtained using traditional organic solvents. Extraction using pressurized liquid such as subcritical water (SW) constitutes an attractive technique, because it allows rapid extraction and reduced solvent consumption. Hot compressed water or subcritical water (SW) is a common designation for water occurring when water is pressurized to a temperature and pressure under its critical level conditions (100–374 °C and up to 22 MPa). One of the main advantages of this technique is that the selectivity of SW allows for the manipulation of extracts profile by changing the operating parameters, since the more polar ones are extracted at lower temperatures and the less polar compounds are extracted at higher temperatures (Mazza and Pronyk 2015). Procedures have already performed and evaluated for different kinds of extractions for recovery of catechins or anthocyanins and flavan-3-ols from red grape pomace, even more to obtain sugars from grape seeds (García-Marino et al. 2006; Vergara-Salinas et al. 2013). Recent works with promising results are also reported. Therefore, Pedras et al. (2017) focused on valorization of white wine grape pomace testing different water temperature, leading to higher carbohydrate and phenolic compounds recovery. They also obtained different extracts exhibiting ten times enhanced antioxidant activity than grape pomace extracts obtained by hydro-alcoholic extraction. Tian et al. (2017) optimized SW procedure for resveratrol recovery from grape seeds and apart from the higher extraction rate, the authors stated that extraction time was significantly reduced meaning less energy consumption together with the high added value of resveratrol extraction by SWE. This extraction approach has recently become a popular green processing technology and emerges as a promising extraction and fractionation technique for replacing the traditional extraction methods. Concerning industrial applications, the use of pressurized low-polarity water provides a number of advantages over traditional extraction techniques (i.e. organic solvents, SLE), such as higher quality extracts, shorter extraction times, lower costs of the extracting agent and also environmental compatibility. Additionally, hydrolysis using hot water as an alternative does not require the use and the need of recovery of additional chemicals or special equipment. However, work on the purification of substance extracted by SW requires further investigation. Though SW still has some way to go before being practically competitive with traditional methods, there is a strong trend for this technique to develop and flourish in the future. An alternative method for grape pomace in industry applications is based on the ultrasound-assisted extraction (UAE) used for the recovery of bioactive compounds. UAE is attributed to the acoustic cavitation phenomenon, assisting the solubilization of the compounds of interest into the solvent, enhancing their removal from the bulk raw material (Azmir et al. 2013). Like other waves, it can pass through a medium by creating compression and expansion. The higher the expansion of the ultrasound power is, the more solvent could enter cells and the more target compounds could permeate cell membranes and disrupt plant cell walls. This led to improved release of the target compounds suggesting that increasing ultrasound power could enhance compounds yield (Roselló-Soto et al. 2015). The efficiency of UAE extraction relies on sonication simultaneously enhancing the hydration and fragmentation process while facilitating the mass transfer of solutes (Ghafoor et al. 2009). Amplitude plays an important role in the intensification of extraction. The raise of the amplitude increases also the number of compression and rarefaction cycles of ultrasonic waves, leading to a higher delivery of the compounds (Al-dhabi et al. 2017). Several works reported in the literature used the ultrasound-assisted extraction for phenolics recovery from grape skins, achieving high yields in short periods of time (El Darra et al. 2013; González-Centeno et al. 2010, 2015; Drosou et al. 2015). Furthermore, much progress has been achieved with regard to the ultrasound-assisted extraction of grape peel, anthocyanins and resveratrol (Cho et al. 2006; Li et al. 2010a, b; Ghafoor et al. 2009; Tao et al. 2014). Moreover, the effects of solvent type, extraction temperature, solvent/solid ratio, amplitude level, and pulse duration/pulse interval ratio on the yield of phenolics extraction could be optimized to improve quantity the and quality of recovery compounds (Goula et al. 2016). Pan et al. (2012) reported that UAE reduced the extraction time of phenolic compounds from pomegranate peels by 87% and presented an antioxidant activity greater than 22% greater than those obtained by maceration. Carrera et al. (2012) also reported a reduction in the time of extraction of phenolic compounds from grapes with UAE requiring 10 times less extraction time than that of maceration. All the above studies reported that this improvement in extraction with the use of ultrasound favors the rupture of the cell wall, with the subsequent increase in the penetration of the solvent. Propagation of the ultrasonic waves through a liquid medium causes damage to the vegetal wall resulting in high solvent penetration and the subsequent release of the content of polyphenolic compounds (Medina-Torres et al. 2017). The UAE9i previously described has also been used for dietary fiber extraction, suggesting that it is a good alternative for the extraction of pectin from grape pomace on an industrial scale (Minjares-Fuentes et al. 2014). The interest of UAE for industrial applications lies in that fact that it is a technology that promotes the use of renewable raw materials through the extraction of phenolic compounds. The advantage of scaling this method of extraction focuses on the use of power, resulting in a better recovery yield, and more concentrated extract at comparable S/L ratio, improving the product quality. In addition to implementing the substitution of organic solvents with solvents that do not present toxic effects, it consumes less energy during the process when compared to conventional methods. It also minimizes process time and temperature, which is useful for the extraction of thermo-sensitive compounds. Since conventional maceration is a time and energy-consuming method which cannot be adopted at commercial level for efficient extraction procedures, UAE represents a feasible environmentally friendly technological option for industrial scale-up. The microwave assisted (MAE) is also considered as a novel method for extracting soluble compounds. This approach is based on microwave heating which is based on non-ionizing electromagnetic waves. Microwaves are a non-contact heat accelerating the transfer of energy and reducing the thermal gradient. The reduction of particle size in grape pomace promotes an increase in the surface contact between solids of the grape pomace and the solvent and also an increase in the extraction efficiency. Zhang et al. (2007a, b) and Liazid et al. (2011) successfully used MAE to recover proanthocyanidins from the grape seeds. Scaling-up was studied, whose results showed to be useful in determining industrial process feasibility and the economic value of polyphenols for commercial use. High voltage electric discharge (HVED) is another slightly different extraction technology recently introduced. It is based on the application of a high voltage resulting in particle fragmentation and cell structure damage that accelerate the extraction of intracellular compounds. The efficiency for the extraction of phenols and the possibility of applying these results at a pilot scale have been established (Boussetta et al. 2011, 2012). However, comparing it with laboratory scale, the results showed that higher energy was required to obtain equivalent extraction rates. Thus, in terms of establishing a reliable and sustainable alternative to traditional extraction methods, further studies are required to evaluate the energy costs. Comparison of different extraction methods for recovery and isolation of bioactive compounds or combinations of them have also been reported in the literature, like the recovery of aromatic aglycones from grape pomace using liquid–liquid and pressurized liquid extraction (Muñoz-González et al. 2013). The authors observed that grape pomace by-products can be a source of glycosidic aroma precursors that after hydrolysis can release unique odorant compounds based on their aroma quality and low odor thresholds. The use of PLE working in the optimized conditions highly increased the extraction rate compared to the conventional LLE. Moreover, Da Porto et al. (2013) compared grape seed oil extracted by Soxhlet and UAE. The results of this work show that the oil yield by UAE increased with higher ultrasonic power and obtained with a lower solvent consumption and a shorter extraction time. Barba et al. (2015) compared the efficiency of US and HVED on the recovery of selective compounds, particularly for anthocyanins, by evaluation of cell disintegration indexes. Even though less selective, concerning recovery, of anthocyanins, HVED proved to be the best technique for higher phenolics recovery with lower energy requirements. In another study, Dang et al. (2013) combined a simple technique of aqueous two phase extraction (ATPE) with microwave-assisted extraction (MAE). The authors concluded that MAATPE required lower solvent concentration and less time to extract high amounts of phenolics from grape seeds compared with other methods like heat reflux or Soxhlet extraction (SE). Moreover, Drosou et al. (2015) compared three solvents (water, water:ethanol (1:1) and ethanol) and three extraction methods, including microwave-assisted extraction (MAE) and ultrasound-assisted extraction (UAE) and the conventional soxhlet extraction. In conclusion, SE water extracts showed better extraction yield followed by MAE and the ultrasonic method of extraction with water and ethanol (1:1) proposed to be used to obtain extracts which are very rich in polyphenolic substances, mainly catechin, epicatechin, phenolic acids, procyanidins and stilbenes. Currently, Syed et al. (2017) discussed the development of a process targeting the production of high-value extracts, a food nutraceutical ingredient, rich in bioactive monomeric flavan-3-ols, using low-value grape pomace as a raw material. The obtained extract was fractionated using membrane technologies that allow obtaining target fractions of bioactive compounds and also to the recycle of the solvent. To improve the purification of the individual monomeric and oligomeric flavan-3-ols from grape pomace, fractionation by nanofiltration cascades with recycle of permeate was implemented. Extraction of proanthocyanidins and anthocyanins from grape skin was also performed using ionic liquids (Ćurko et al. 2017). This work showed that the differences in methods’ efficiency depend on the anion and cation structure and concentration. More recently, Caldas et al. (2018) investigated solid–liquid ratios along with ethanol concentration and ultrasound or microwave-assisted extraction. US presented the best performance presenting twice higher phenolic yield than mechanical agitation and in a very shorter time, indicating that the cellular alterations promoted by ultrasound and microwave application favored the release of these compounds. Finally, as proposed by Zhu et al. (2015), the extraction of dietary fibers and sugar from vegetable raw materials can be effectively conducted by conventional solid–liquid process, which can be assisted by microwave or ultrasound technologies or by applying enzymes as an alternative to help disrupting the cell wall ultra-structure. Figure 6 presents the most reported advantages and disadvantages of conventional and emerging green technologies for grape pomace. A large number of food, cosmetic, and pharmaceutical applications of grape pomace extracts have been reported in the literature, since they act as multipurpose ingredients or additives in different fields of industry (as shown in Fig. 7). Concerning the field of food industry, lipid peroxidation is a detrimental process in food system that affects PUFA (polyunsaturated fatty acids) and other lipids. This process combined with auto-oxidation and microbial contamination progressively reduces the nutritive value of a product, the food quality and consumers’ food acceptance. Fractions of grape by-products into food beverages have already been evaluated, as the use of grape pomace extracts as natural antioxidants, preservatives, color stabilizers and texturizers in meat products by Beres et al. (2017). Over decades, synthetic compounds such as butylated hydroxyanizole (BHA), butylated hydroxytoluene (BHT), propyl gallate (PG) and tertiary-butyl hydroquinone (TBHQ) have been widely used as phenolic antioxidant additives and food preservatives in food sector (Ramis-Ramos 2003). However, they have been broadly studied at high doses for potential toxicities including hazard for carcinogenicity and genotoxicity. BHA acted as a tumor promoter on the rat gastric squamous epithelium and induced hyperplasia only at high doses (Williams et al. 1990), whereas BHT could be an enhancer of thyroid carcinogenesis and rat liver hyperplasia under specific conditions (Ito et al. 1985; Inai et al. 1988). Although the concern about the possible actions from chronic exposure, FDA (Food and Drugs Administration) concludes that there are no available data that BHA demonstrates a hazard to health from exposure at current levels. However, Japan is a country that has no longer allowed the use of synthetic antioxidants BHA and TBHQ in food industry. Over the recent years and under these circumstances, interest in the substitution of the synthetic food additives by natural ones has increased. Wine-making products could offer an alternative source of natural antioxidants in the food industry and a wide range of natural additives such as tartaric acid and enocyanine (E163). Natural tartaric acid is used as a natural preservative, as an emulsifier in the bread making industry, as an acidifier in the wine making industry and as an ingredient to enrich biscuits, sweets, jams, jellies chewing gum, cocoa powder, and alcoholic drinks (Jim and Hong-Shum 2003). Enocyanine, known as E163 in the food sector, is also a natural pigment derived from the anthocyanins in grape skin. Nowadays, EFSA (European Food Safety Authority) allows the use of anthocyanins as food dyes in drinks, marmalades, candies, ice creams and pharmaceutical product. Recently, Marchiani et al. (2016) evaluate the use of grape pomace antioxidants, before or after distillation, as ingredient in cheese-making process. This study demonstrated that grape pomace powder can be a functional ingredient and be a new approach to achieve a functional cheese. Furthermore, research on utilization of dietary fiber from grape pomace has been conducted as a potential functional ingredient seafood (Sánchez-Alonso et al. 2007a, b) to reduce rancidity on ice storage, as alternative fining agents for red wines to remove red wine tannins and in dairy products to increase the dietary fiber (Guerrero et al. 2013), as total phenolic content and to delay lipid oxidation in yoghurt and salad dressings (Tseng and Zhao 2013a, b) or in bakery products (Acun and Gül 2014). Extracts of grape pomace were also successfully incorporated into chitosan edible films (hydrophobic and hydrophilic), providing antioxidant properties and promising shelf-life extension (Ferreira et al. 2014). Moreover, grape pomace has a potential application in wine industry. To be more precise, adding seeds from wine pomace during wine fermentation in a warm climate at a dose of 900 g seeds/150 kg grapes improved the antioxidant potential of red wines, as indicated by total phenolic content (TPC) and total flavonoid content (TFC) (Jara-Palacios et al. 2016). In an older study conducted by Pedroza et al. (2011), when dehydrated waste grape skins used as raw additives were able to release significant amounts of pigments, bioactive compounds and aromas into white wines, with similar characteristics to commercial rosé wines. Currently, Gil et al. (2018) used fibers from “Cabernet Sauvignon” (Vitis vinifera) pomace as fining agents for red wines. 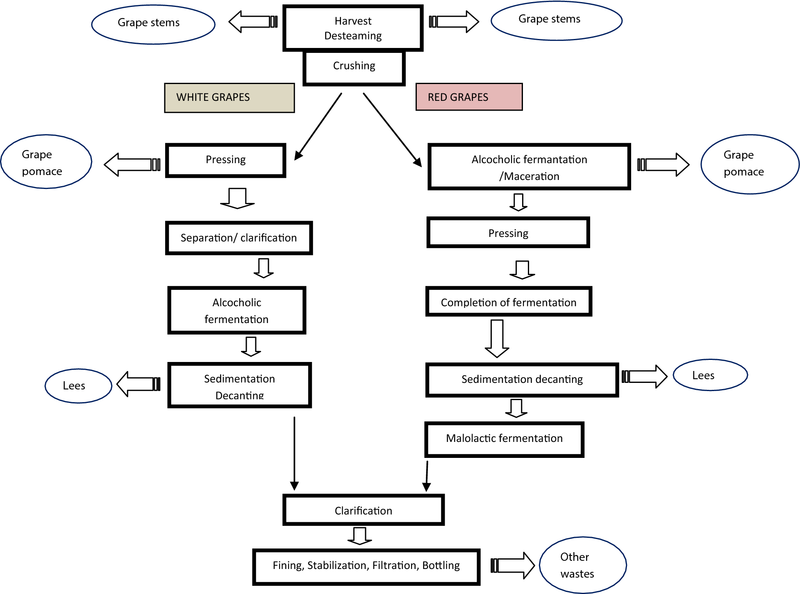 The authors highlighted that this type of treatment could be a good tool for winemakers to obtain cell wall material from nonfermented grapes by reusing winery wastes instead of commercially valuable fresh grapes. Beyond the satisfactory and desired effect (color, texture), the use of products derived from wine pomace can also induce sensory repercussion. In this case, Rosales-Soto et al. (2012) reported that grape seed flour increased the acceptance rates of appearance, flavor, taste, mouthfeel, and texture attributes. Later, Acun and Gül (2014) also reported that incorporation of 5% of grape pomace flours (seedless wine pomace, whole wine pomace, and seed flours) in cookies improved their acceptability. Table 2 summarizes indicative applications for grape pomace in the last few years. The findings confirm that grape pomace extracts have the potential to protect foods from oxidative damage and lipid peroxidation. Grape seed as well as vitamin E was successful in extending the shelf life of lamb meat after the 7th day of storage by reducing lipid peroxidation and meat discoloration of about 20% (Guerra-Rivas et al. 2016). Surprisingly, under refrigerated storage conditions, grape seed powder at a level of 0.1–0.2 g/Kg acted as a better antioxidant for cooked beef and pork patties, compared to oregano water extract and rosemary oleoresin (Rojas and Brewer 2007). Similar effects appeared when red grape extract was applied in pork burgers by Garrido et al. (2011) and when grape pomace dietary fiber was applied in minced fish muscle during frozen storage by Sánchez-Alonso et al. (2007a, b). Considering the effects of grape pomace extract on cooked and uncooked chicken meat, Selani et al. (2011) revealed antioxidant activity during frozen storage under vacuum, due to the phenolic concentration. As stated earlier, different components of wine pomace interact with microorganisms in food, protecting them from spoilage flora, therefore, limiting the color deterioration, acidification, slime forming bacteria and gas production. For instance, antimicrobial effects against Z. rouxii and Z. bailii were observed in apple and orange juice after application of red and white grape pomace at concentrations corresponding to 20–100 g/Kg of phenolics (Sagdic et al. 2011). Researchers, in an effort to prevent food spoilage from the growth of microorganisms (e.g. Lactobacillus spp., Pediococcus spp., Streptococcus spp., Leuconostoc spp., Aeromonas spp. and Alteromonas putrefaciens), focus on natural antimicrobial components. Particularly, grape seed extracts delayed the growth of TAMB, LAB, Pseudomonas spp. and psychrotrophic populations in pork patties (Lorenzo et al. 2014). Silvan et al. (2017) also reported epicatechin gallate and resveratrol as the most active compounds. The antimicrobial activity of grape pomace has been extensively studied and was attributed mainly to the high content of gallic acid, followed by hydroxy benzoic and vanillic acid in the grape seed extracts (Tesaki et al. 1999). They presented antimicromial effects against B. cereus, C. coli, E. coli 0157:H7, S. infantis (Katalinic et al. 2010), L. monocytogenes ATCC 7644 and S. aureus ATCC29213 (Xu et al.2016). In a different study, Dias et al. (2018) suggested another food application for this agricultural by-product using probiotic bacteria as a bio-preservative. In that case, the whole pomace was used as source of polysaccharides which represent a dietary fiber supplementation and a possible prebiotic function which increases the probiotic population. Additionally, some published studies also presented the capacity of wine pomace products to promote the activity of or even to protect probiotic microorganisms. A far as concerns food applications, it has been shown that the use of grape pomace enhanced L. acidophilus fermentation by stimulating lactic acid production and reduced the fermentation time (Frumento et al. 2013). A similar effect was observed by Aliakbarian et al. (2015) who enumerated higher counts of S. thermophilus and L. acidophilus after fermentation. A serious concern regarding food processing is acrylamide and advanced glycation end products (AGEs) formation, resulting from Maillard reaction and heat-processed foods, respectively. Acrylamide is classified as “a probably carcinogenic agent to humans (2A) and dietary AGEs are known as risk factors for diabetes, renal and cardiovascular diseases. Polyphenols from skin extracts and grape seeds have been proved to block the formation of acrylamide in a simulated physiological system and during the frying of potato chip (Xu et al. 2015). Another potential food hazard is that both nitrites and nitrates are added to meat products giving the characteristic color and also inhibit the growth of Clostridium botulinum. Successfully, grape seed was able to reduce residuals of nitrite after ripening of dry-cured sausages and to inhibit N-nitrosodimethylamine formation (Wang et al. 2015). The last has been identified as a mutagenic and a carcinogenic agent in all species examined, according to WHO (2002). Wine-making by-products could be converted to functional and novel foods due to their multifunctional characteristics. Grape pomace extract can undoubtedly be used as a functional ingredient in food and beverages adding health benefits over and above the nutritional value. Nowadays, grape pomace powder can be used in cheese-making process, enhancing cheese total phenolic content and antioxidant activity. In parallel, the addition of grape pomace powder seems to have no effect on cheese proteolysis (Marchiani et al. 2016). Consequently, dairy products such as yogurt and cheese are fortified with whole wine pomace power and/or extract in order to increase the mineral content and inhibit the lipid oxidation (Tseng and Zhao 2013a). Furthermore, when Rosales-Soto et al. (2012) enriched cereal bars, pancakes and noodles with phenols from Merlot grape seed flour, they achieved a high antioxidant activity and an increased consumer acceptance. Fortification of white bread with grape seed extract (Coe and Ryan 2016) and freeze-dried skin wine pomace (Mildner Szkudlarz and Bajerska 2013) seems to reduce postprandial glycemic response, total cholesterol and LDL levels, respectively. In the fruit processing industry, apart from antioxidant activity and color stability, white grape skin extract in a model fruit juice retained the stability of probiotic strains L. rhamnosus, B. lactis and L. paracasei, during storage (Shah et al. 2010). Finally, an improved mineral profile of meat products has been achieved after application of a new seasoning derived from wine pomace. Precisely, higher levels of potassium and calcium and lower levels of sodium were present in treated meat samples compared to the control ones (González-SanJosé et al. 2015). Nitrates and nitrites added to meat products can form nitrosamines after reaction with a secondary or tertiary amine in the body. These compounds are considered as carninogenic ones according to the IARC. Grape seed extract could lower the levels of nitrite in dry-cured sausages and the levels of nitrosamines produced (Li et al. 2013), and also could inhibit the formation of N-nitrosodimethylamine (Wang et al. 2015). Grape pomace has an incredible potential to synthesize via fermentation hydrolytic enzymes such as xylanase, exo-polygalacturonase (exo-PG) and cellulose. These enzymes are commonly used in wine cellars during clarification processes as well as in food, paper and pulp industries (Walia et al. 2017). To enhance such utility, researchers fermented a mixture of grape pomace with orange peels causing a more efficient production of pectinase and xylanase. Similar or even better results were obtained from other agroindustrial wastes (Diaz et al. 2012). Moreover, grape pomace can be utilized as a substrate for production of microbial proteins. These may play multiple roles, serving as an alternative source of high-quality protein in livestock feed or directly as an alternative protein source for human nutrition (Matassa et al. 2016). Single cell protein (CSP) has a high proportion of essential amino acids like lysine and valine; carbohydrates; fats; vitamins and minerals or certain essential amino acids. Bioconversion of grape pomace into microbial protein could be a promising step in reducing the protein malnutrition, especially in developing countries. Nevertheless, serious limitations of SCP from bacteria, yeasts, fungi and algae should be considered to minimize health hazards. Consumers claim to be concerned about allergies, skin irritations and possible health risks from long-term exposure to synthetic preservatives (e.g. parabens), colorants, aromas and stabilizers making natural formulations and organic products to become central to the aging market. Polyphenols from grape pomace due to its anti-ageing properties could be an alternative, new cost-effective source for cosmetic industry. Cosmetic products include sunscreen, face peeling with Vitis Vinifera (Grape) Seed Oil (BioAroma Natural Products, Greece), skin-care, anti-ageing eye creams, anti-ageing moisturizers, face serum to treat dark spots from Caudalié (France), day or night creams and Grape Pomace Scrub Kit (Alexandria, VA, USA). The latest contains recycled pomace (29%) that assists human skin cell repair. Grape pomace and especially grape seeds can act as a valuable agent in skin care cosmetics, with antibacterial and antifungal properties (Baydar et al. 2006). In spite of these benefits, it should be noted that heavy metals and pesticide residues may be present in winery wastes. Thus, the cosmetics industry should remove them before entering into cosmetic formulation (Soto et al. 2015). Regarding encapsulation and delivery, plant polyphenols present significant limitations due to chemical instability, low water solubility and low bioavailability. For this reason, encapsulation into a nanoemulsion-based delivery system of resveratrol could increase the bioavailability and protect the bioactive compound from degradation (Davidov-Pardo and McClements 2015). 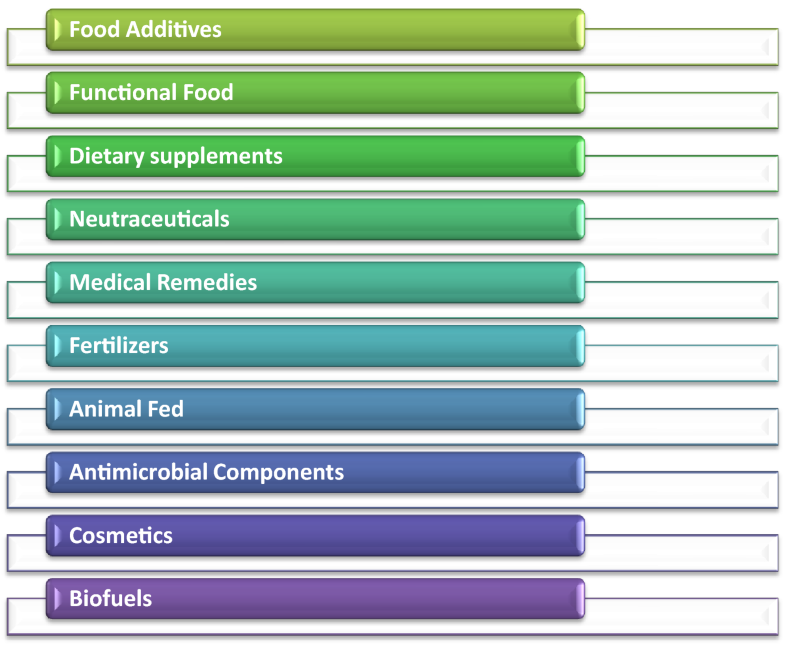 Encapsulation and other stabilization methods have been developed in cosmetic pharmaceutical, food, and agricultural applications. In the USA market, many dietary supplements are based on grape seed, grape extract and red wine powder due to their antioxidant, hypoglycemic and hypolipidemic effects. Grape seed extracts have been used in Europe for therapeutic purposes for several decades. OPCs (Oligomeric Proanthocyanidins from Grape Seeds) are often prescribed by doctors in typical doses 50–200 mg/days, as a complementary medicine and not as a replacement of conventional medicine (Weseler and Bast 2017). Since grape polyphenols are regarded as natural antioxidants that play a role in human health and disease, grape seed extract has been recently considered as a powerful antioxidant food supplement. In the market, for instance, the Lamberts® Super Strength Antioxidant Complex contains an ORAC blend from green tea, grape seed, rosemary and oregano extracts. Each tablet provides 10,000 mg ORAC units due to its high polyphenol content. A second dietary supplement promoted for cellular protection is the Solgar Grape Seed Extract 100 mg that contains phenolic compounds (95%) such as oligomeric proanthocyanidins, monomeric polyphenols (catechins, epicatechin and epigallocatechin), organic acids (citric, gallic, epigallic acid and malic acid). LifeExtension® Resveratrol with Pterostilbene contains synergistic phytonutrients like trans-pterostilbene and quercetin to augment resveratrol’s effects. The food supplement company states that the particular combination “promotes youthful gene expression similar to calorie restricted diets, encourages healthy insulin sensitivity and mitochondrial function and supports a healthy inflammatory response”. A recent study conducted by Sun et al. (2016) concluded that GSPE administration may protect the retina against hyperglycemic damage, possibly by ameliorating oxidative stress-mediated injury via the activation of the Nrf2 pathway. Another potential use of grape pomace in pharmaceutical industry is as a drug delivery vehicle. Some drugs are either unstable or no soluble in water. Considering this, microemulsions of grape pomace are considered as suitable vehicle of delivery of topical antiviral, anti-inflammatory, antioxidant (tocopherol), steroidal, antibacterial, antifungal drugs and various local anesthetics. Kumar et al. (2014) achieve better drug absorption across skin compared to cream, gel or lotion. In these conditions, the pharmaceutical market would potentially receive benefit by the addition of grape pomace microemulsion as a raw ingredient and satisfy the consumers’ demand for organic, less toxic drugs. The potential application of wine pomace has received high interest from agricultural organizations, since groundwater contamination from chemical fertilizers is associated with gastric and testicular cancers, birth malformations, as well as neurological, immune and endocrine dysfunctions in mice studies. 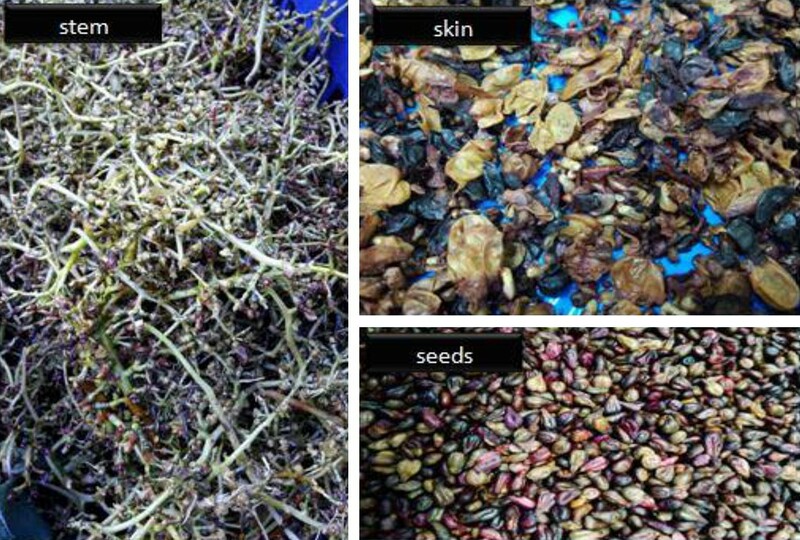 Grape pomace as a heterogeneous mixture of seeds, skins, pulp, and stalks usually cannot directly applied into the soil, because of the possible pathogens. It should be composted at first and then can be used as a soil conditioner. Low costs composts derived from winery wastes have given promising results in horticulture and modern greenhouse agriculture, alleviating stress on the environment. Grape pomace as an organic fertilizer has a certain value mainly due to low content in phosphoric acids and nitrogen. Chemical analyses of the compost based on winery waste reveal variety in different elements such as Ca, Mg, Fe, Zn and heavy metals (Pb, Ni, Cr, Cd). In this way, it could gradually replace other chemical fertilizers recovering heat and CO2, during composting (Ferrer et al. 2001). In strawberry cultivation, pressed grape skins (25% v/v) mixed with pumice (75% v/v) produced an average fruit yield of 306 g per plant and biomass of 97 g per plant. These values were higher than those derived from olive tree leaves compost (Manios 2004). Several works reported in the literature have used the grape seed by-product in farm animals feeding. In the last years, it is estimated that 3% of grape pomace produced is reused for animal feed (Dwyer et al. 2014; Brenes et al. 2016). For example, Taranu et al. (2017) showed that although grape seed diet did not influence the pig performance, it reduced the production of inflammatory cytokine (IL-1β, IL-8, TNF-α and IFN-γ) in the liver of pigs by suppressing the protein expression of the regulatory molecules NF-Kb and Nrf2. Moreover, administration of grape seed cakes during finishing period decreased significantly (− 9.05%, p < 0.05) the cholesterol concentration and increased lgA level (+ 49.90%, p < 0.05) in plasma. Inclusion of fermented grape pomace in the diet of finishing pigs increased the number of total PUFA in the subcutaneous fat of the animals, reduced lipid peroxidation and increased color stability of meat. Apart from studies in pigs, feeding cows with diets containing grape marc were associated with increased concentration of PUFA in milk, changes in the ruminate bacterial community composition and improved cow health (Moate et al. 2014). Beneficial effects on diarrhea appearance, immune and antioxidant response were also seen in weaned piglets after administration of grape seed proacynidins (Sehm et al. 2011; Hao et al. 2015). Furthermore, the addition of grape pomace in the broiler diets was reported to increase the immune responses and reduce the feed cost per kg of live weight (Ebrahimzadeh et al. 2018) The results of that work suggested that the inclusion of up to 10% grape pomace in diets did not adversely affect broiler chickens’ performance and improved the antioxidant and immune responses of broiler chickens. The conventional methods of treatment of heavy metal contamination includes chemical precipitation, chemical oxidation, ion exchange, membrane separation, reverse osmosis, electro dialysis etc. These methods are not very effective, are costly, require high energy input and often contribute to generation of toxic by-products. For these reasons, there is a necessity for environmental engineers to treat heavy metal-polluted wastewater, in a cost-effective manner. Various agricultural wastes, including grape stalks, rice husk, black gram, waste tea, Turkish coffee, walnut shell, etc., have been established as potent adsorbents for heavy metal removal (Tripathi and Ranjan 2015). The application of grape marc is negatively correlated with concentrations of heavy metals (Cd, Cu and Ni) in soil. The process of extractability of metals is a pH- and a time-dependent procedure (Karaka 2004). Winery wastes have been assessed as an adsorbent of heavy metals, Cu, Cr and Ni from aqueous solutions. Grape stalk wastes were examined as absorbing material for Cu(II) and Ni(II) removal from aqueous solutions. Results showed that ion exchange is the most important mechanism that takes place in the sorption process with significant release of Ca2+, Mg2+, K+ and H+ from grape stalks due to the uptake of Cu(II) and Ni(II). In addition, grape stalk wastes can be reused for the decontamination of metal-containing effluents (Villaescusa et al. 2004). Producing other products from usage of agricultural goods is a novel idea. There is an attempt to cause bioconversions and biotransformations of winery waste to high value products, since the biorefinery concept was introduced to face the global energy crisis and climate change. Bioethanol is an alternative source of sustainable energy. Europe is one of the biggest biodiesel markets worldwide where more than 8 billion liters are consumed annually. Biodiesel achieves a reduction in CO2 emissions and uses renewable raw materials from plant oils (cottonseed, rapeseed, soya, palm, and sunflower) and from other wastes. Grape marc, vinasses, wine lees, and winery wastewater have been used as raw materials to produce lactic acid, biofuels including ethanol, enzymes, chemical intermediates and energy through anaerobic digestion and pyrolysis process. Following the biorefinery idea, the solid fibrous plant parts (pomace, seeds, stalks or seeds) can be used to produce high value chemicals. Solid grape wastes are fractionated by enzymatic or chemical hydrolysis producing hemicellulose, pentoses, 5-C polymers, cellulose, hexoses, 6-C polymers and lignin, phenols. These fractions will be then converted to useful chemicals such as ethanol, carboxylic acids (acetic, butyric acid acetic acid), butanol, acetone and others (Luguel et al. 2011). Nevertheless, feedstock production and processes might be costly. Factors that may affect the biorefinery concept on winery waste include harvesting, transport, handling, treatment, storage, distribution, chemicals and heat mobility (Zacharof 2017). The production of biomass surplus and energy recovery from wine residues illustrates the most important innovation in vine-growing sector. In Australia, in 2006, the Tyrell’s Wines Company states that the value of spent grape marc as a biofuel is 10 times greater than the value from selling it for feedstock. In Canada, in 2007, Inniskillin Wines and Storm Fisher Biogas in collaboration with other company created renewable electricity from the winery’s grape by-products. From this collaboration, about 1000–2000 tonnes of by-products instead of disposal were used as a fuel and the produced methane gas was used to generate power for homes in the Niagara region (Spingo et al. 2017). The conversion of biomass into thermal and electrical energy could bring both economic and environmental benefits (Corona and Nicoletti 2010). When green technologies are developed and applied, sustainability should be properly assessed by the Life Cycle Approach. This means that green technologies should be compared with other conventional or alternative ones, considering both recovery and disposal aspects (Spingo et al. 2017). The utilization of grape pomace in so many aspects gives the researchers promising results. Winery by-products are good sources of phytochemicals that act as antioxidants and as health promoting agents in cosmetic and food industry as well as in food supplementation and pharmaceutical field. 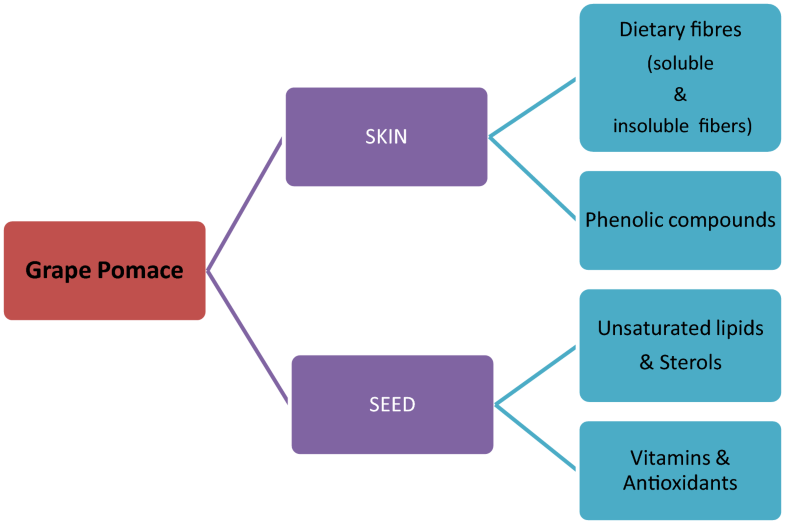 In terms of safer pharmaceutics and cosmetics, companies need to assess the potential toxicity and be aware of any potential adverse side-effect before entering phytochemicals into food supplement and skin formulation. Although tests in animal models have found grape seed extract to be safe, it can also exhibit a pro-oxidant state, depending on the dose, the duration of administration and other dietary components. Further research and scientific studies will provide evidence about efficacy and safety of polyphenolic herbal remedies as alternative or as add-on therapy of certain diseases. Regarding the environmental issues, consumers together with food sectors and stakeholders tend to move towards more sustainable wine production practices, focusing on green technologies. The total amount of these compounds, as well as the specific profile like identity and relative proportion, is strongly dependent on the type of residue. In this sense, research should also be focused on the structural elucidation of other novel bioactive compounds derived from vinification residues such as grape stems or lees. In this regard, the identification of specific polyphenols of the separate winery wastes has prompted the development of more extensive panels of valorization options for these residues being also a compelling reason for further research on this topic. Adequate procedures allowing integration targeting these products through time-saving technologies for sectorial industries will provide successful achievements for phytochemical recovery and innovative products, which could contribute to the reduction of environmental pressure in winery areas from winery by-products. Bioactive compounds extraction involves complex mechanisms and it can be achieved by various techniques. Increasing the extraction yields, reducing processing time and reducing environmental damage caused by toxic solvents, can be achieved through green technologies replacing conventional ones. Novel extraction processes are usually complex thermodynamic systems with high costs. On the basis of the available data from conventional solvent separation to enhancement of integrated processing approaches, concerning extraction of bioactive compounds from grape pomace, comparative remarks have been stated. The application of conventional methods (SLE, US-SLE) has the advantage of being accessible for most laboratories, with satisfactory recoveries when extraction parameters have been successfully optimized. In the case of emerging technologies, extraction techniques such as SFE and ASE have demonstrated their suitability for the extraction of bioactive compounds, achieving recoveries similar to or better than conventional ones. However, more pilot-scale studies are necessary to select the optimal technique after evaluation of the costs to produce commercial reliable extracts. Moreover, the modeling of these extraction processes could provide a better understanding of these mechanisms and they may be used to optimize the extraction conditions and scale up any design. Nowadays, based on the literature, there is still a long way to go until all these residues gain a factual recovery pathway, making the winemaking process a more sustainable activity contributing to reduced costs and environmental impact linked to the disposal of these by-products in the production areas. Consequently, a great deal should be devoted enriching the holistic wine waste chain, optimizing extraction approaches for pilot-scale applications. However, the scenario for innovation and future research sustainable separation for the recovery of agroindustrial waste is beginning to bring together various areas and sectors towards more efficient and circular systems. Like all agro-food productions, the winemaking process generates organic waste as a series of important by-products considered to be potential resources for valorization. According to that, properly managed winery by-products are encouraged to be reused and exploited for alternative purposes like added-value products. Further research requires the optimization of formulation (ingredients, food processing, and packaging) to achieve the highest quality possible. A large number of wine pomace applications described in this review highlighted the high potential of the valorization of winery by-product in the different industries. The potential advantages of the applications described are compelling reasons for further research on this topic. EK investigated references and drafted the manuscript, IL investigated references and drafted manuscript, tables and figures, PB investigated references, PAT review concept, structure and topics, ES developed manuscript concept and review topics, and structure. All authors read and approved the final manuscript. 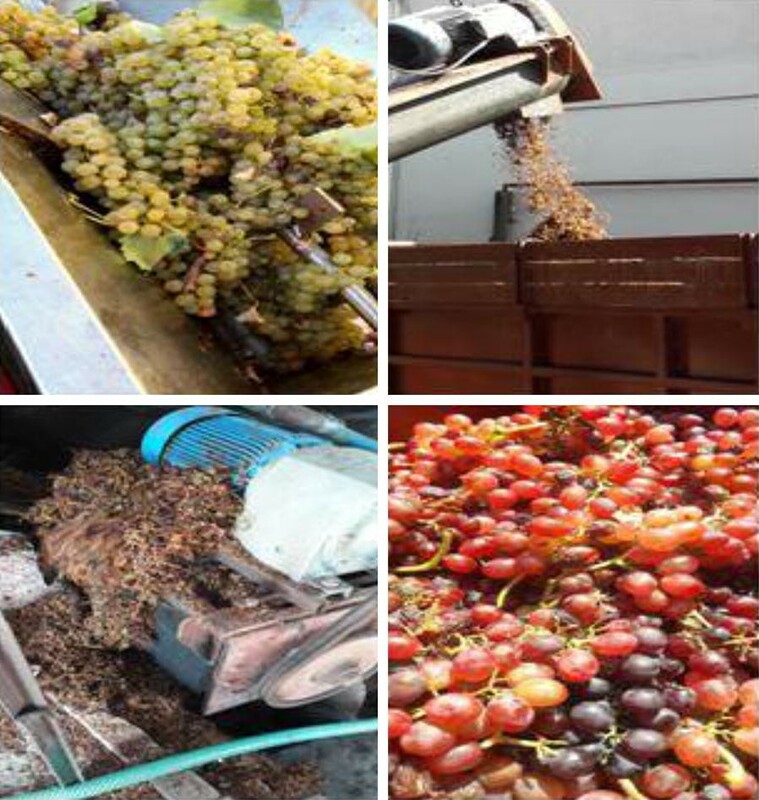 The present research was carried out by the Technological Educational Institution of the Ionian Islands within the framework of the project “Valorization of winemaking residues for the production of high added value raw materials for the food, cosmetics and parapharmaceutical industry” of the ROP “Ionia Nisia 2014-2020”, Co-funded by the European Union (ERDF) and Greece. This study deals with the recent innovative exploitation of bioactive compounds in grape wastes and the benefits achieved when a waste management potential is implemented, as well as presenting available extractive technologies food applications. The authors have no data/materials to deposit. The manuscript is based on a literature review of sources included in the reference list.